Regatas Lima (LBL) added to their roster 30-year old American center Howard Crawford (205-107kg-88, college: UAB). It is actually his comeback to Lima as he has played here before. Crawford just played at CDU Catolica in Chilean Liga Nacional. In 5 games he recorded 14.4ppg, 7.8rpg and 1.6apg this season. The most of last summer Crawford spent at CAN Oruro (Libobasquet) in Bolivian league where in 19 games he averaged impressive 16.3ppg, 8.9rpg and 2.4apg. He helped them to make it to the final after they ended regular season as second best team. A very spectacular season in his career as he was voted to Latinbasket.com All-Bolivian Libobasquet 2nd Team. Crawford also played for San Jose (Metropolitan League) in Paraguayan league that season. He is quite experienced player. Thanks to Crawford's pro career he managed to play on four different continents (Europe, Asia, Latin America and of course North America) in ten different countries. Crawford has played previously professionally also in Estonia, Holland (Zwolle), Iraq (Al-Tadamoun and Nift Al-Janoub), Kuwait, Luxembourg, Mexico (Gigantes), Romania (Politehnica Iasi), Uruguay (Larre Borges, Goes and Capitol) and United Kingdom (London Leopards). He attended University of Alabama at Birmingham until 2010 and it is his ninth season as a professional player. CD Valdivia prevailed against Los Leones to register the second straight win in the championship series. 32 personal fouls committed by Los Leones helped opponents get some easy free throw opportunities. American forward Khapri Alston (196-94, college: Midwestern St.) orchestrated the victory with a double-double by scoring 43 points (!!!) and 19 rebounds. Argentinian point guard Nicolas Ferreyra (185-85) contributed with 20 points and 9 assists (was perfect 8-for-8 from the free throw line) for the winners. American forward Cameron Forte (201-93, college: Portland St.) replied with a triple-double by scoring 24 points, 11 rebounds and 12 assists and his fellow American import point guard Scott Rodgers (191-87, college: Drexel) added 31 points in the effort for Los Leones. Both teams had five players each who scored in double figures. 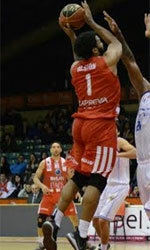 CD Valdivia fired past Los Leones to take the lead in the championship series. Deportivo Valdivia made 26-of-34 free shots (76.5 percent) during the game. 26 personal fouls committed by Los Leones helped opponents get some easy free throw opportunities. Worth to mention a great performance of Argentinian point guard Nicolas Ferreyra (185-85) who helped to win the game recording 26 points and 5 assists (made all of his eight free throws). American Tracy Robinson (201-86, college: Loyola, IL) contributed with a double-double by scoring 19 points, 10 rebounds and 5 blocks for the winners. American forward Cameron Forte (201-93, college: Portland St.) answered with a double-double by scoring 22 points, 20 rebounds and 7 assists and the former international point guard Eduardo Marechal (186-85) added 14 points in the effort for Los Leones. Both teams had four players each who scored in double figures.